Superior filtration efficieny and higher contaminant capacity over other filters. Full flow design with anti-drainback and pressure relief valves; cellullose, synthetic and glass blend media lasts longer and filters better than paper. A second oil filter extends the life of the engine's full-flow filter. It filters 10% of the oil leaving the lubrication circuit and returns it to the pan resulting in cleaner oil passing through the full-flow filter. Amsoil By-Pass filters remove particulates down to 1 micron in size and acts as a water seperator to remove moisture from the crankcase. Also increases engine oil capacity. Mount and element sold seperatly. Replace at every other oil change. A more efficient dual fltration system than the OEM full-flow/by-pass filters. An adapter plate directs all oil flow to a remote dual filter header which diverts more oil flow through the by-pass filter than the By-pass kit above. Complete with Super Duty and By-Pass filter elements. 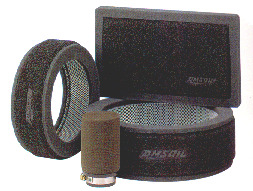 Allows greater air flow and better filtering capability over paper filters. Longer service interval over replacing paper elements. To clean, remove from vehicle, wash in detergent and warm water, allow to air dry. Uses Amsoil Foam Filter Oil. Specifically designed for Amsoil's reuseable foam air filters. 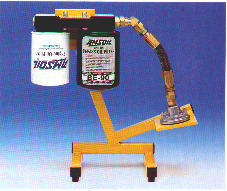 Special "high tack" oil to trap and hold dirt and dust. and is recommended when using oil analysis to extending you oil drain intervals. Amsoil makes lubricants for gasolene-powered vehicles as well as marine and two-cycle applications, and other car-care products. Ask me for a free catalog. If you become an Amsoil Preferred Customer you can purchase products at dealer cost for your own use. As an Amsoil Inderpendent Dealer you may purchase for resale.